Does Samsungs' small footprint 20" monitor offer big performance? At 20 inches in size, the Samsung SyncMaster P2070 is diminutive compared to common 24" beasts, but with its high-gloss black design and use of clear plastic on the stand and bezel surround, this is clearly not a monitor to be ignored. It's an attractive and sophisticated look that fortunately doesn't detract too much from the screen. Unlike other monitors, Samsung hasn't hidden the connections away beneath the screen, so setting this screen up is easy. What's more, there is only a power input and DVI connection to hook up and that's it. Samsung bundles a direct DVI cable with the P2070 for a digital throughput, as well as a DVI to VGA cable for those with a more standard analogue connection. Instead of standard control buttons, Samsung has maintained the simplistic approach by adding a row of touch-sensitive controls along the bottom of the bezel. Swipe your finger across them and they come to life and offer the standard menu and brightness controls. The screen has a maximum resolution of 1600 x 900 pixels, which is great for a monitor of this size, but is the lowest resolution in this group test. The colour balance is sharp and, with it being a widescreen display, movies look great on this screen. This is aided by a fast response time, so there were very few signs of jaggies or pixelation when running video through this monitor. However, the screen has a very narrow viewing angle and, unless you sit directly facing the screen, you'll notice a red tinge very quickly cutting across the panel. This won't be a problem for single users, but becomes a problem with multiple viewers. What's more, as the monitor's display is sat on a basic rod stand, you won't be able to pitch or angle the screen. 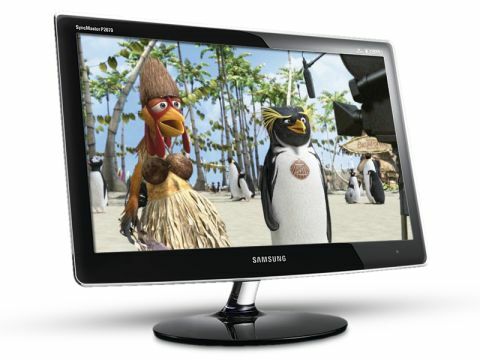 The Samsung SyncMaster P2070 is an attractive large-screen monitor with a fast response time and high colour contrast. Sadly, the narrow viewing angle does detract from what is otherwise a great looking monitor.